We are living in world of accelerating, often overwhelming and disruptive change. To survive and thrive as leaders and organizations, it is more important than ever to build your capacity to engage group wisdom and collaborate effectively in solving complex problems and expanding innovation. CollaborativeWays provides group facilitation services, coaching and training for highly effective meetings that empower people, expand team engagement and collaboration. We work with the deeper layers of leadership and culture to create lasting behavioral shifts that create results. We specialize in the Open Space Technology method and online meeting facilitation. CollaborativeWays is part of WisdomWays Inc. which specializes in personal transformation and self actualization programs to energize your life. LEAD with authenticity from your inner power with the clarity of your purpose, values & strengths. CollaborativeWays coaching and mentoring services assist you in owning your authentic brilliance to lead and develop engaged, energized teams with high impact! ENGAGE the wisdom of your entire team in collaborative, effective meetings to maximize results. CollaborativeWays expert group facilitation will engage and empower your teams in effective meetings to collaborate in achieving your organizational goals. BUILD team capacity and cultural alignment so that your people and organization are wired for success! CollaborativeWays facilitation training and culture assessment tools will assist you in building the internal capacity for collaborative, effective teams. 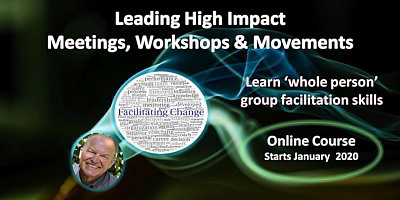 LEARN GROUP FACILITATION SKILLS THAT GET PEOPLE ENGAGED! In this online workshop you will learn how to design and facilitate effective meetings that inspire a culture of engagement and build organizational capacity to thrive with change. This facilitation methodology to lead groups taps into the 'whole-person' and the relationships in profound ways enabling deep learning, collaboration and lasting impact! Learn how to facilitate the Open Space method - a simple, engaging meeting method that opens up group wisdom, collaboration and creativity with surprising results. In this interactive, experiential online Open Space Technology training you will learn how to facilitate this method in both the in-person and virtual environments. Do you need an experienced online facilitator for your next global meeting or conference? CollaborativeWays specializes in online collaboration for widespread organizations and teams.